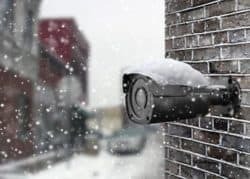 In the past, the only ones who could afford security cameras were public places, businesses, and some affluent and well-to-do homeowners. CCTVs were quite expensive and required professionals installers to install them properly. Today, security cameras are much easier for the general public to obtain but finding one for your home or office that is affordable yet reliable is the tricky part. Don’t worry, we have your back because we know that you not only want reliability in a security camera system but you are also looking for the best home security camera system under $300. After many tests of different systems to use for home or office we’ve narrowed it down as the Amcrest 960H Video Security System to be the best security camera system under 300 dollars. Below we will break it down why this camera is such a good buy for those looking for a reliable, good quality security camera system on a budget. The Amcrest 960H Professional Video Security System is simple, while not sacrificing on reliability. In a previous review we posted on this system we came to the conclusion that without a doubt the Amcrest 960H System could be the best security camera system on the market today, especially for home users. The 960H video security standard offers widescreen high definition by using advanced image sensors that provides for 34 percent higher resolution over ‘D1’ traditional CCTV systems. 700 was once thought to be the highest possible line density until 800+ TVL was released. 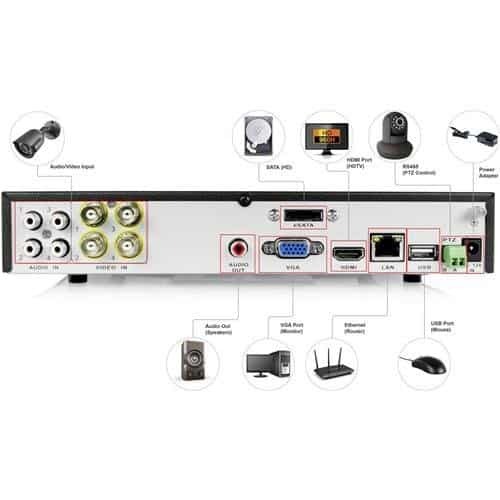 The Amcrest 960H DVR system handles the high density of detail provided by 800+ TVL and takes it one step further by giving fully uncompressed signal transmission, thus eliminating latency in order to deliver true realtime feeds with crisp hi-resolution images unmatched by any other TVL platform. The 960H cameras easily connect point-to-point directly to the DVRs making setup very easy for most users. The DVR acts as a single control hub for all of the cameras the system comes with. This in turn makes the cameras easier to secure. Since Amcrest’s systems are backwards-compatible with their previous systems that use coaxial connections, the upgrade to the 960H system is simpler and more practical. In our experience all you had to do is switch out the cameras and DVR but keep the same coaxial cabling that was there before. The cool looking 800+ TVL IP66 heavy-duty metal bullet cameras come with a 3.6 millimeter lens and offer a wide 75° viewing angle, along with 24 high-intensity IR-LEDs for night vision. The night vision gives you incredible clarity at distances up to 65 feet. 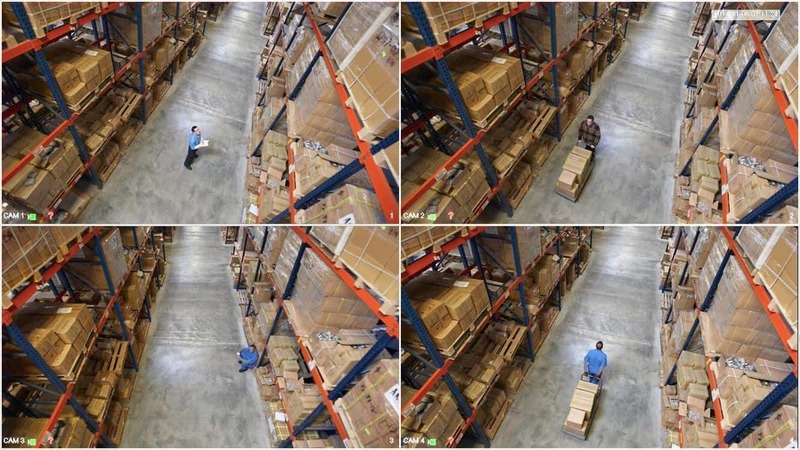 The cameras’ infrared mode is automatically activated when low lighting conditions are detected, and with the system’s uncompressed signal transmission, it is capable to deliver realtime, reliable video security without loss or delay. To be quite honest any intruder who dares to cross paths with this system will risk having their every move illuminated and captured in high detail. A very neat feature that you can easily implement with this system is being able to use the DVR to customize motion detection exactly to how you need it. 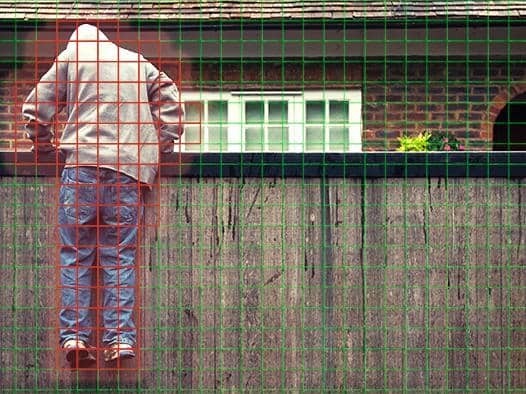 You can set a perimeter zone, specify which areas of the camera’s motion grid are active, and even set a 24×7 schedule for when the alert system is armed or disarmed. The motion sensor sensitivity can be customized also, in order to prevent false alarms such as plants moving by the wind blowing them just as an example. When a camera detects motion depending on the settings you have chosen, the system is capable of activating multiple security responses including turning on the DVR’s buzzer, sending alert emails, and triggering recording. 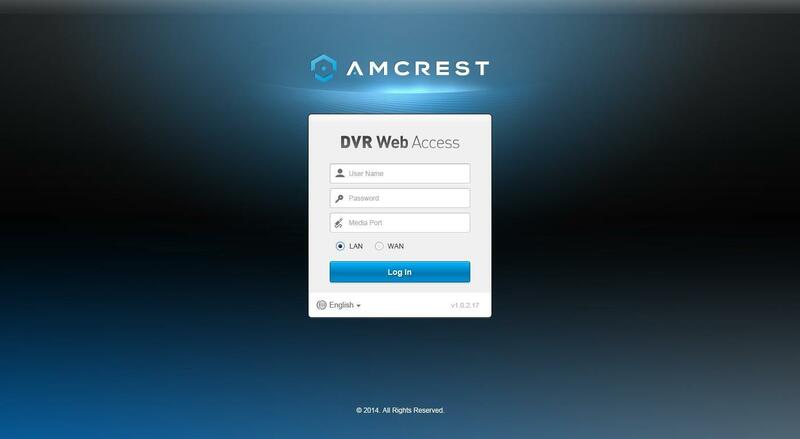 Amcrest is doing something right with these new line of security systems which make closed-circuit surveillance and remote access a reality and very simple for users. All of the camera’s channels are HTTPS-encrypted and will run on your network by using the DVR as a central hub. Access to the system is easier to guard than on IP-based systems whose cameras may act as points of entry to those who have bad intentions. We also like the fact that Amcrest has gone beyond providing an internal UI. This UI was created in order to produce really nice designed interfaces for remotely managing or viewing the camera system using only common PC web browsers or your smartphone. When we first received this system to test we were thrilled to see the different ways to create backups. It comes with a pre-installed 500GB hard drive that will enable you to continuously and simultaneously record on all channels (all four camera feeds) at the maximum 960H resolution for up to six days. That is 144 hours of HD video! of storage space on your hard drive. The DVR can be set to automatically overwrite the oldest stored footage on the hard drive or you can transfer the video files through USB to a memory stick or an external hard drive. These backup options are not offered by many security camera systems on the market which we were excited to see in the 960H. 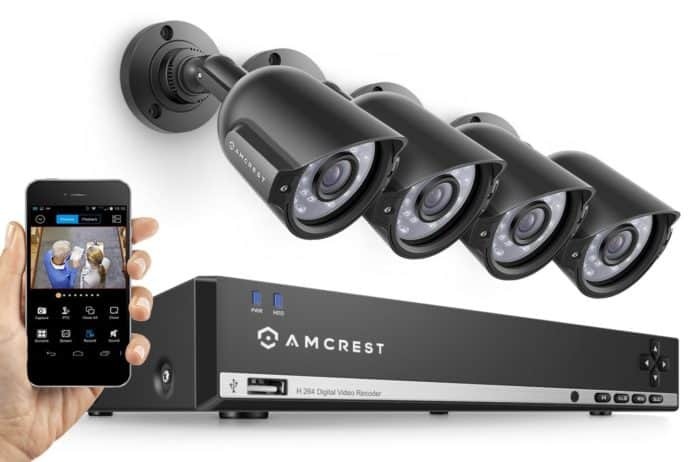 The good thing about Amcrest in general is that all of their systems come with heavy-duty metal IP66 cameras including the 960H. These cameras don’t feel cheap which most users will find refreshing when it comes to long-lasting durability that is desired from the cameras themselves. The cameras are engineered to perform in severe environmental conditions. We tested them in cold environments, warm environments, and rainy environments and they didn’t fail to perform properly. Although in rainy conditions it is expected for viewing to be limited if water hits the camera, but that can happen to any camera unless the camera is mounted under a canopy of some sort. The IP66 rating that the cameras come with means that they have been tested as completely airtight against dust and able to endure any kind of wind and rain. We were impressed with each camera’s excellent build quality and felt confident of their reliability. 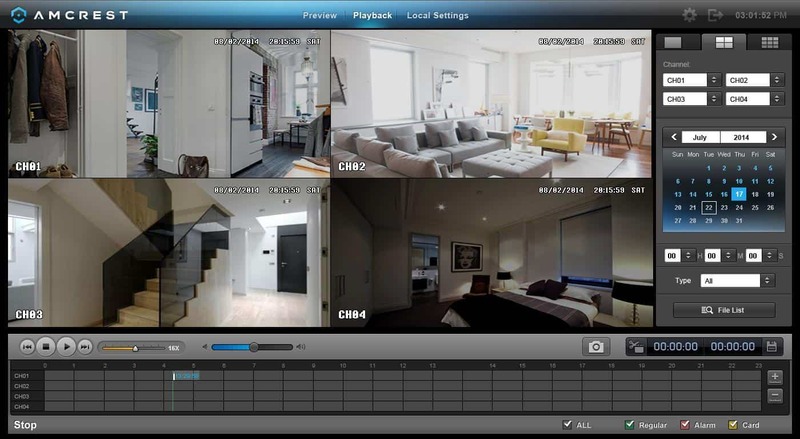 The system comes options such as Live View which can display video channels together or individually with icons indicating the status of certain functions like motion detection and audio on each channel. The system allows you to control a variety of robust image parameters through a toolbar such as playback, audio settings, pan/tilt/zoom (if PTZ cameras are connected), and other options. 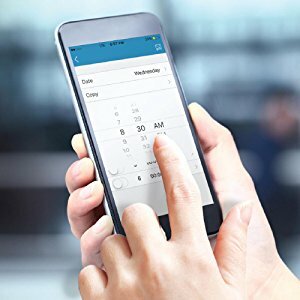 Another cool option that is provided by the DVR’s Playback Interface is that it can search footage by its date or time as well as by the specific recording type, such as manual footage, footage triggered via motion detection, the scheduler, or an alarm event. The video controls include rewind, fast-forward, play, pause, and adjustable slow motion. The DVR’s also comes with a built-in Recording Scheduler that uses a 24×7 calendar for each camera which also comes with customizable triggers. We specially liked the DVR’s configurable smart security features. 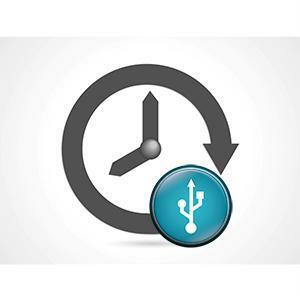 The alarm is automatically triggered in case of any disruptions to the system such as a loss of video, full hard drive storage, hard drive errors, or disconnected network cables. We found the online interface to not be too bad compared to other interfaces on the market. The interface provides secure, streamlined remote system access and can easily be controlled using a basic high speed internet connection and a common PC web browser such as Internet Explorer, Google Chrome, or Mozilla Firefox. Live View is fully functional and includes access to the Playback Interface, local settings, device settings, image controls, viewing modes, volume controls, and even options that control the CPU load to customize the video stream to the computer’s processing power. The web version of the Playback Interface has buttons for play, pause, stop, single frame forward, and taking snapshots as well as options for downloading footage to your computer’s hard drive. There is a separate Device Settings interface that seems to also gives the user full remote control over the system, very much like the local DVR menus. Web accessibility for the Amcrest 960H doesn’t seem to be a quickly built piece of software: it is fully integrated and very feature-rich from our experience. This can be good or bad depending if you prefer a simplistic interface or a more involved interface. The UI’s design can be a little overwhelming but will certainly give you complete control over the device suite. Amcrest provides a Link app which was amazingly easy to set up in our opinion. All you have to do is use your smartphone’s camera to scan the QR code sticker that comes on the DVR unit, then enter a name for the device, and tap ‘Start Preview.’ to get instantly connected. The app’s Live View interface come with options to control the pan/tilt/zoom (if PTZ cameras are connected), toggling channel views, customization of the number of video screens you want, switching between main and sub-streams, capturing screenshots, recording video to your phone’s internal storage, and sound toggling. The Link app also offers a Playback Interface so that the files that are locally recorded can be instantly viewed on your phone at your convenience. Believe it or not for many consumers warranties and support options are important factors when it comes to making a purchase of anything technology. 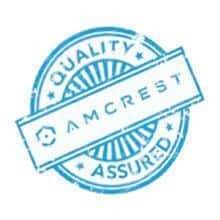 Amcrest offers a 1 Year Domestic Warranty plus Lifetime Support with purchases made through Authorized Retailers. Conditions apply according to their website so it would be better to contact their customer care or visit their website for further information. Nevertheless the warranty and support offered really makes this full-featured, quality engineered model one of the best values available out there amongst professional grade surveillance device suites. After much testing we don’t doubt that users will enjoy peace of mind knowing that if any component of the 960H system ever stops working within a year of purchase, it will be replaced promptly from any the US based operations. What makes Amcrest 960H an almost perfect system is the incredible value that you get for a price that will not break your budget if your in the market for a system that is under $300. This unit definitely delivers on quality, dependability, ease of setup and versatility. This security system for the most part, will not leave you in the dark as far as setup, usability, and functionality is concerned. It just flat out works and does what it was designed to do very well. If you would like to download the user manuals for this product as well as other documentation click here. For more information about Security Cameras and Surveillance in general click here.